.TONIGHT...N to NW winds 5 to 15 kt, becoming S. Seas 4 to 6 ft.
4 to 6 ft. Areas of fog with VSBY 1 nm or less. .THU...NW winds 5 to 15 kt, becoming N to NW. Seas 3 to 5 ft.
.TONIGHT...S to SE winds 5 to 15 kt, becoming S 10 to 20 kt. 5 to 7 ft. Areas of fog with VSBY 1 nm or less. .THU...NW winds 10 to 15 kt, becoming W. Seas 3 to 5 ft.
.THU...NW winds 5 to 15 kt, becoming S to SW. Seas 2 to 4 ft.
.THU NIGHT...S to SE winds less than 10 kt. Seas 2 to 3 ft.
.FRI NIGHT...S winds 15 to 20 kt, becoming W to NW 15 to 25 kt. .TODAY...S winds 5 to 15 kt, becoming W. Seas 6 to 8 ft.
.TONIGHT...W to NW winds 5 to 15 kt. Seas 4 to 7 ft.
.THU...NW winds 5 to 15 kt. Seas 4 to 6 ft.
.SAT...S winds 20 to 25 kt, becoming W to SW. Seas 8 to 10 ft.
.SAT NIGHT...W winds 10 to 20 kt. Seas 6 to 10 ft.
ANZ833: Cape Hatteras to Cape Fear to 100 NM Offshore. 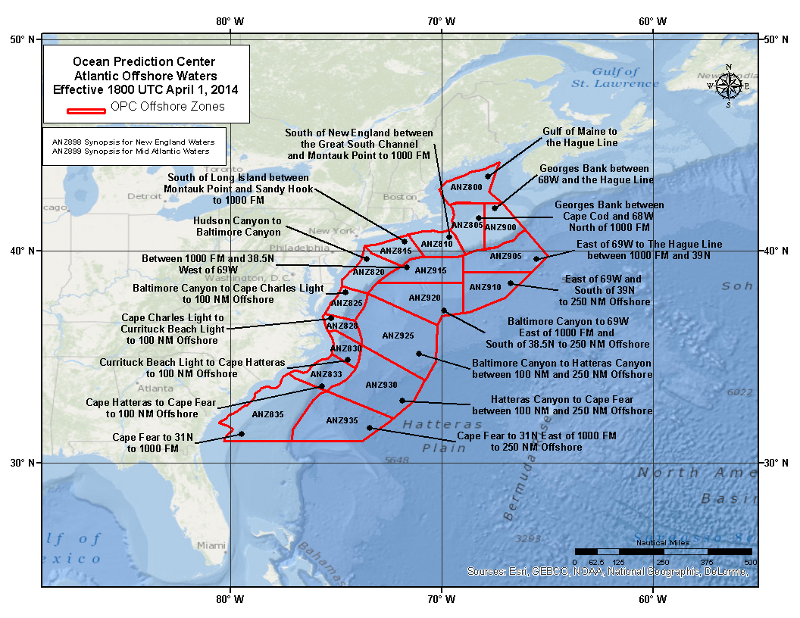 Below is a map of the Array Offshore Waters Forecast. Clicking on a zone will display the forecast for that area.